Best friends, nothing もっと見る than that. It's such a strong breath of fresh air when a female antagonist doesn't fall head over heels for a man, especially in a ディズニー animated movie. Because they have chemistry and a good relationship, unlike other 最近 ディズニー couples which are just rude and condescending. Sure, Nick and Judy don't get along at first, but then they quickly made a good friendship. IMO if they were couple they'd be much better than Flynpunzel and Kristanna, which are just the same couple only in spring and winter options. Because people like shipping. Also because of how close they are? I don't ship it, because personally I like having a male and female character that are best フレンズ but don't have a romantic relationship, but everyone is different. Because people are obsessed with this "shipping" bullcrap, to the point where they must not have a life. The concept of shipping is so retarded in my opinion. I hope they don't get together, so it will teach the shippers that ディズニー doesn't give a crap how badly they want certain characters together. ディズニー has the right to do what they want with THEIR own characters, not the fans. 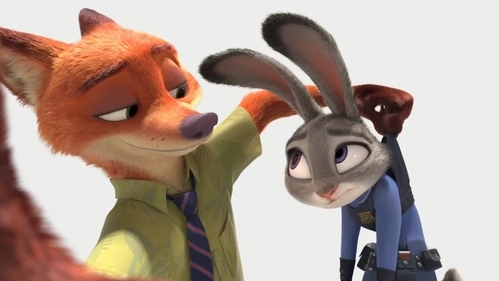 Simply because Nick is a guy and Judy's a girl. That's a stupid reason for not wanting them to be together! OMG one is a fox! The other is a bunny! あなた sound like those people who complain for no reason about a black person and a white person being in a romantic relationship. Gee, maybe it's because of the chemistry between the two of them and the affection they 表示する for each other? And do あなた have something against an interspecies couple? Are あなた a ファン of Donald Trump? Do あなた regularly watch 狐, フォックス News?? Person ya need to cool down. People often have different opinions. How did あなた get "Donald Trump" ファン from this question?